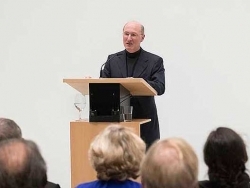 Educated at Magdalen College, Oxford where he read Modern History and French, he pursued post-graduate studies in History of Art before taking his first post as curator of Kettle’s Yard, University of Cambridge. During the six years that he ran the gallery he developed the exhibition programme to become one of the leading venues for modern and contemporary art outside London. During this period the gallery doubled in size. With exhibitions of the work of Käthe Kollwitz, Ben Nicholson, Henri Gaudier-Brzeska, Frank Dobson, John Piper’s stained glass, Shirazeh Houshiary and Alison Wilding and thematic shows about Circle and recent Spanish art (the first exhibition of Spanish art to take place in the UK for more than 20 years) among others, Kettle’s Yard became well known nationally. He joined Tate as an Assistant Keeper of Modern Prints but soon became the gallery’s specialist in American art as well as Head of Prints and Drawings. By 1990 he was appointed Deputy Keeper of the Modern Collection and was given responsibility for leading the acquisitions programme and the programme of displays of the collection. In 1998 he became Director of Collections, a new post created in the build up to the opening of Tate Modern, with oversight of the Tate’s Historic British Collection as well as its Modern Collection. With responsibility for devising and implementing an expanded acquisitions strategy, this was a key post at Directorial level. He also organised major exhibitions of Ben Nicholson, Brice Marden, Sol LeWitt, Terry Winters, Bill Woodrow, and Anish Kapoor and wrote catalogues that have become standard texts. In 2002 he left Tate to set up Jeremy Lewison Limited. Among his first clients was the Estate of Alice Neel. At that time Alice Neel was little known beyond the Eastern seaboard of the USA. 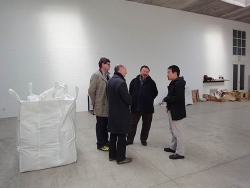 Jeremy implemented a strategy to raise Neel’s profile, first by securing representation for the Estate at Victoria Miro Gallery, London, where exhibitions are held every two years; then by exhibiting her work in Berlin at Aurel Scheibler, who also represents the Estate; and finally by moving the Estate’s representation in New York to David Zwirner. He also organised museum exhibitions at Moderna Museet Stockholm and the Museum of Fine Arts, Houston. The exhibition in Houston travelled to London and Malmö and was singled out by Anne Wagner in Artforum as the best exhibition of the year. His consultancy work for the Estate of Alice Neel is ongoing. Jeremy Lewison has also used his skills and experience to advise private clients, museums and foundations in building collections. He is an advisor to the Kadist Art Foundation in Paris and has brought to their collection many works by younger contemporary artists. He is also constructing a major collection for Art Discovery Limited. 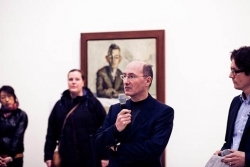 From 2010 to 2013 he was as the pro bono mentor to curators at Bristol Museum and Art Gallery and Arnolfini who, with the help of Art Fund International, purchased international contemporary art with a focus on artists from the Middle East, China and Africa. Jeremy also curates major museum exhibitions. In addition to Alice Neel: Painted Truths, he was the curator of a groundbreaking exhibition J. M. W. Turner, Claude Monet and Cy Twombly: Later Paintings for Moderna Museet, Stockholm, Staatsgalerie Stuttgart and Tate Liverpool, which ran from October 2011 to October 2012. The exhibition was highly acclaimed and broke all attendance records in Stockholm. In 2007 he was invited to mastermind the new displays at Leeds Art Gallery, helping the curators to work as a team and to look at the collection in new ways. The displays opened to great acclaim. Jeremy is also in considerable demand to write articles and books on modern and contemporary art. His many publications are listed in the publications section of this website. Jeremy has been a trustee of the Kiln Theatre (formerly Tricycle Theatre) since 2009 and of Arnolfini, Bristol since 2012.